Peugeot aims to have at least one apprentice in each of its dealerships by the end of 2016, in a drive to get more young people into the motor industry. Currently boasting 300 young apprentices in Coventry based PSA Academy, the programme offers training in a number of disciplines including servicing, sales, parts, customer service and administration – not just mechanics-based roles, in other words. The scheme covers all PSA car brands, comprising Peugeot, Citroen and DS Automobiles, and apprenticeships last anything up to three years. A Level 2 NVQ is awarded at the end of training, while those that qualify will achieve a Level 3 on the job. Anyone aged 16-18 and with a grade C or above at GCSE level Maths and English is eligible to apply for a Peugeot apprenticeship. For more information go to Peugeot's apprenticeships website by clicking here. “While other manufacturers offer similar schemes, Peugeot realises the importance of sourcing young talent who are keen to learn new skills and start a career within our dealerships,” said PSA Academy Director Martin Hamill said. 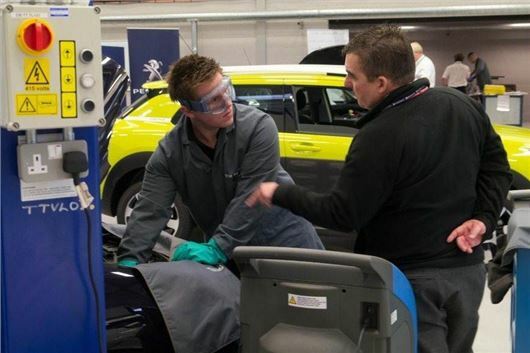 “Apprentices will be employed by a franchised Dealer local to them and trained at one of Peugeot’s dedicated training facilities, while working towards their NVQ in a chosen specialism.